This Queen Anne Victorian was designed by E.G. 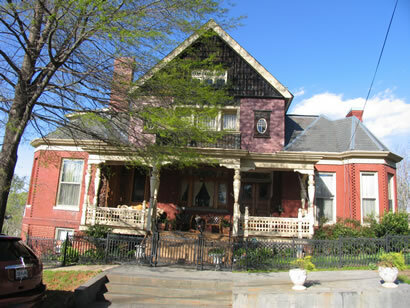 Frye and built by contractors Wilson & Seay in 1894 for William Wilson, president of the Lynchburg National Bank. The original Slaughter home on this site was demolished and replaced by the present structure. An unusual combination of pressed brick, slate and corrugated metal can be seen. Note the copper facing on the second story.